Three years ago, Sophie Mercer discovered that she is a witch. Her non-gifted mother has been supportive, consulting Sophie's estranged father-a warlock-only when necessary. 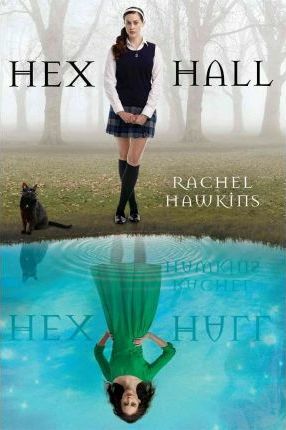 But when Sophie attracts too much human attention for a prom-night spell gone horribly wrong, it's her dad who exiles her to "Hex Hall," an isolated reform school for wayward Prodigium, a.k.a. witches, fairies, and shape-shifters. By the end of her first day, Sophie has three new enemies, a futile crush on a warlock, a tagalong ghost, and a vampire roommate. Worse, Sophie soon learns that an unknown predator has been attacking students. As a series of blood-curdling mysteries converges, Sophie prepares for the biggest threat of all: an ancient secret society determined to destroy all Prodigium, especially her. Hawkins's proficient and entertaining debut is jam-packed with magical creatures and mystery. With no training on how to use the powers inherited from her absent warlock father, Sophie Mercer keeps making rookie mistakes that force her mother to move them around the country to avoid attention. But when, at age 16, Sophie makes a very public error with a love spell at the prom, she is sent to Hecate Hall, "the premier reformatory institution for Prodigium adolescents" (aka troubled shape-shifters, faeries, and witches like Sophie). She hits it off with her vampire roommate, Jenna, but three gorgeous and powerful witches have declared Sophie an enemy (she nicknames them the "Witches of Clinique"); she has a wicked crush on someone else's boyfriend; and at least one teacher is out to get her. When attacks on students get pinned on Jenna, Sophie is determined to find the true culprit. Sophie stumbles into answers more than searches them out, but the story is well paced and plotted with tween-friendly humor and well-developed characters, particularly awkward but compassionate Sophie. The ending satisfies while paving the way for future books. PW"
Rachel Hawkins (www.rachel-hawkins.com) is a high school English teacher. She lives with her family in Alabama, and is currently at work on the next book in the Hex Hall series.